Learn the ropes of rappelling. Let out that adventurous streak in you. See the world from a different angle! And what if you have a fear of heights? We will help you overcome it. Learn the safety tips and skills of rappelling from out instructors. And then set out to conquer the heights – professionally, in full gear. What’s more, you’ll get to see the world and yourself from a whole new perspective! Be in the shoes of Robin Hood just for a day. Try your skills at archery. It’s challenging and fun! Why challenging? Because it requires balance, poise, vision, timing and accuracy! Learn the basics from our instructors. They help you choose a bow that’s most suitable for your size and a target most appropriate for your age and skill. They will also teach you how to shoot an arrow safely and precisely. Try it out! You will see how archery improves focus and concentration. Unleash the Bond 007 in you! Relive all those western movies that made your hair stand on end! You’ll have our staff assist you until you get the hang of holding a rifle. Know the determination that eggs you on to hit the target. And rejoice when you finally do. This is not only a recreation, but a physical and mental exercise too! Got a goal to achieve? Get your team along and get some exercise for your mind and brain. Got the nerve for the height? And a spirit for adventure? Well here’s the opportunity to test it. Rock climbing is not as easy as it looks from the ground. When you begin climbing you will realize how tough it is to climb the rocks. But that’s just half of the story. Climbing down is tougher. But the satisfaction of completing the feat and the reward of an amazing view from the top is well worth the climb. So, time to slip on your climbing shoes! Zip across the air along the zipline. Just like a falcon darting across the sky. Feel the wind in your hair. Look down at the world and enjoy the view, rather, the bird’s eye view. The aerial view of the earth is the most beautiful, as you would have seen from an airplane. 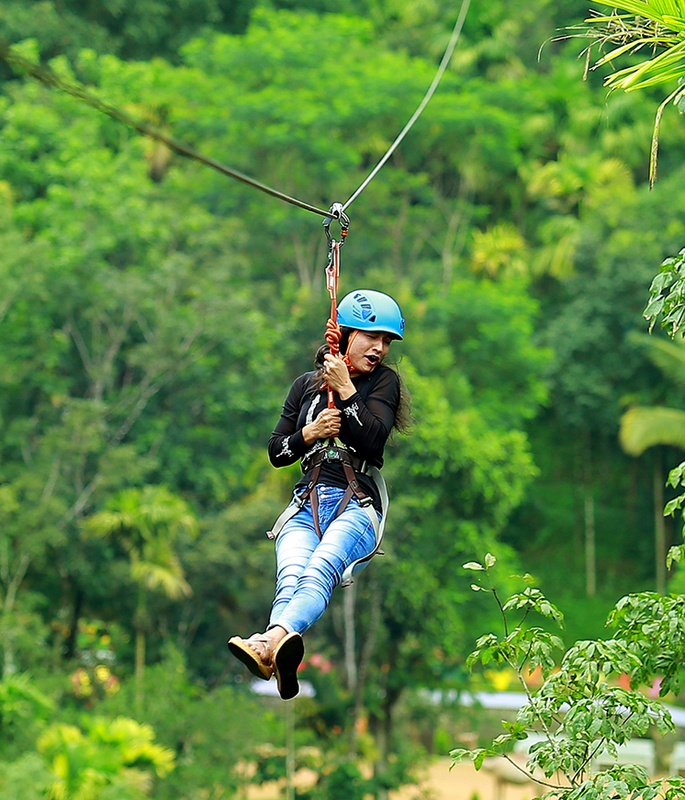 But on zipline, you feel like a bird, with no walls to constrain you and restrict your views. Enjoy the stunning panorama – and not through a window! Ever thrown something out of a window and watched it fall through the air? Ever wondered what it feels like to give in to gravity? Well here’s your chance. Experience the heart-in-the-mouth feeling of falling freely from a height. Don’t worry; your safety is in our hands. Our safety systems are state-of-the-art. You just give in and enjoy the fall, as you and the earth race up to meet each other! By the way, you are allowed to scream and screech all you want. INR 300 per head (group requires 5-10 pax minimum) Aim, shoot, hit and reload. Go all out and spill some colour. Destroy your opponents and save yourselves from being hit, and escape spot-free! Shoot and eliminate your opponents by hitting them with dye-filled pellets. Paintball is a sport that involves stamina, agility and pure, simple fun! The paintballs cause no harm to the participants or the environment. Paintball can be played in a variety of ways by people of all age groups just for the element of fun as well as for skill development. Paintball has great potential for team building, as it helps dissolve interpersonal differences and enhance camaraderie among team members. Break the chill with a bit of thrill! Engage in some fun activity while breaking down inhibitions and improving group dynamics. Ropes courses are outdoor activities that challenge the players physically and mentally. The activities offer the participants both physical and mental exercise, thus improving their overall agility. The courses use sophisticated systems ensuring safety of the participants. The group initiatives involve cooperative games, which help in breaking the ice amidst team members and strengthening their mutual trust, augmenting interpersonal relationship and improving team work and coordination. Let the adrenaline rush up your veins. Feel your heart race up. This is a wonderful opportunity to let loose the kids and the kid in you.